one of the biggest tourist destination forums & expo in Indonesia - an event where travel and tourism industry could meet directly with consumer to gain information access on traveling to various tourist destinations in Indonesia and overseas. 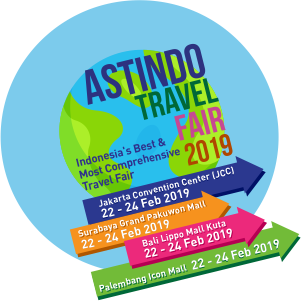 Popular tourist destinations all around the world & Indonesia Various type of travel packages, including pilgrimage tours with special value to overseas & Indonesian destinations Best offer fares from selected - leading international airlines The right place where you plan your dream vacations without hassle and to explore the possibilities, to buy your dream holidays and to understand more about the destinations Come and visit ASTINDO Travel Fair 2019..! !